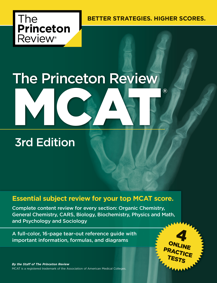 The Princeton Review MCAT test prep books not only include a comprehensive content review for each section of the MCAT, but also vital test-taking strategies and tips necessary to secure a top MCAT score. The Princeton Review MCAT books include comprehensive content review, vital test-taking strategies, and tips to secure a top MCAT score. 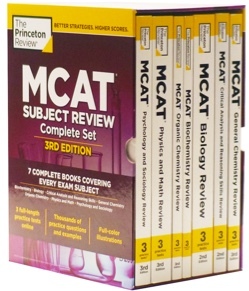 With 7 complete subject guides,3 online practice tests, and thousands of practice questions, The Princeton Review’s MCAT boxed set brings you everything you need to ace the MCAT—at an unbeatable price! This all-in-one resource covers MCAT test essentials, topic-by-topic subject reviews, test-conquering strategies, a tear-out “cheat sheet” reference guide, and 4 full-length online practice exams for total test preparation. 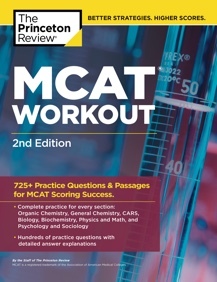 With more than 725 high-yield strategic solutions—all written by top Princeton Review MCAT experts—this workout book provides targeted practice necessary to master all MCAT subjects. Comprehensive MCAT prep that gets results. Study from anywhere on your own time.